Guibao Wang was born in sometime, 1997 and The FuliYuan (a government social service) found it on APril 15, 1997. His current father, the only father or mother he knows, took him home about one year later. He lives with father (54), his grandma of age 83, and his totally disabled aunt. His aunt is 56 and has been diabled (can not speak and lies on bed for years). His father is a farmer and can not go out to do odd jobs due to the family situation. His father was injured last year and did some sugery 10 months ago and has not completely recovered yet. Guibao likes math and Chinese and basketball. Yanting Zhang is a 5th grader born in December 2000. She lives with her parents and older sister. Her father was found to have bone disease in 2005 and is now handicapped. 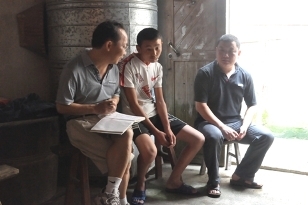 His sisiter was supported by us in high school and is now a sophomore in Mathematics at FuYang Normal University to become a teacher. Her mom works in farm to support the family, and was incidently my middle school student 31 years ago. She likes Chinese and reading. She reads a lot of books, and is very cute and lovely. 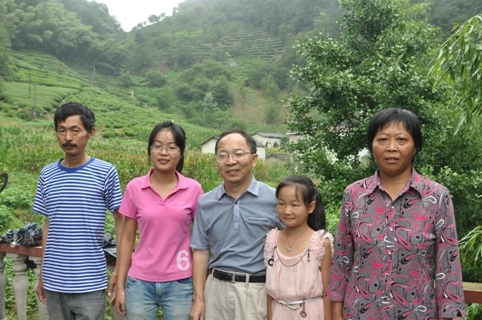 Lei Zhou is a 6th grader born in November 1999, and lives with her father and grandpa. Her mother left them long time ago and has never come back to see her. This hurts her very much and even I can feel it when talking with her. 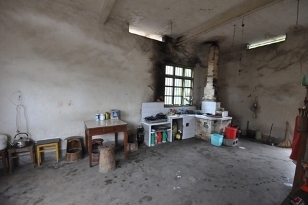 Her house was too dangerous to live that the government helped his family build a simple house last year. She lives Chinese in class and it takes her 30 minutes to get to school by bus or her father's motocycle. Her father does odd jobs locally to support the family. Peicheng is a 7th grader born in October 1998. She lives with her parents and her older sister. 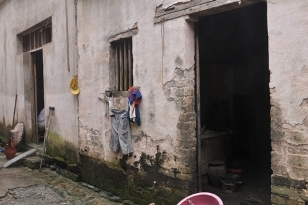 Her sister is a sophomore in a college in Hefei with some financial aid and award from the school. Her sister is also a leader in school and works full time during summer to support her college life. Her parents work on farm and do odd jobs locally to support the family. They rent a house (no apartments in countryside). He is very good in school, likes in particular math and Chinese. He is sunny and lovely. He also likes basketball. The one siting next to him is his math teacher. Qian Wang is 9th grader born in Feburary 1997. She will go to Ningguo High School (best in Ningguo city/county) next Fall for his high school life. She lives with her parents and old sister. She is very good at English and Chinese. Her older sister is a sophomore at Nanjing Hang Tian University, a top university in China. Her mother is still a little handicapped due to a car accident in 2007. Her father owns a three wheel vehicle and uses his vehicle to make money for the family. She is sponsored by Professor Jian-Shu Li and his family. 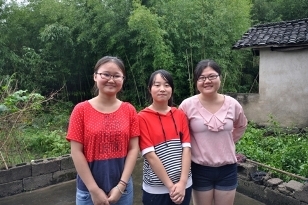 The middle one in the photo is Qian Wang and the other two are college students who came with us to see countryside life. The right hand side is part of his house.